“We recognize the need to stay in front of changing market conditions and customer preferences,” explained GM CEO Mary Barra in perfect corporate-speak in the statement released this morning, as employees are fretting about their jobs. The phrase, “changing market conditions,” in regular English means that sales are skidding in the US despite enormous incentives. GM’s new-vehicle deliveries in the US plunged 11% in the third quarter and are down 1.2% for the year. In Canada, GM’s sales have dropped 1.6% so far this year. GM apparently expects these “market conditions” to worsen further, and it’s getting ready for it. So GM is going to cut 15% of its salaried workers and salaried contract workers. At the end of 2017, GM had 54,000 salaried workers in North America. Of them 52,000 are in the US. That’s a lot of folks: 15% of those North American salaried workers amounts to 8,100 people. Included in this group are some people who may have already accepted voluntary buyouts. And “to streamline decision making,” GM will slash 25% of its executives – starting with CEO Barra? Just kidding about the Barra part. Eight plants to get shuttered. Two assembly plants: Detroit-Hamtramck Assembly in Detroit; and Lordstown Assembly in Warren, Ohio. And two propulsion plants: Baltimore Operations in White Marsh, Maryland, and Warren Transmission Operations in Warren, Michigan. In Canada, GM will “unallocate” its assembly plant in Oshawa, Ontario. In South Korea, GM will close, as previously announced, its plant in Gunsan. “Outside North America,” GM will close two additional plants, at undisclosed locations. “These manufacturing actions are expected to significantly increase capacity utilization,” GM said. It didn’t specify in the news release what would happen to those hourly workers. But it’s not all that hard to imagine. In the US, this could mean that 3,600 factory workers could be out of a job, though some workers could be transferred to other plants. At its operations in Oshawa, Canada, GM employs currently about 2,500 hourly workers and 300 salaried workers; and they’ll be gone. The goal of all this is to save “approximately $6 billion” in cash flow a year “by year-end 2020 on a run-rate basis,” it said. This includes cost cuts, such as payroll reductions (see above) of $4.5 billion and a reduction in capital expenditures of $1.5 billion. But this is happening at the internal-combustion-engine side of GM. EVs are on an entirely different track. “GM now intends to prioritize future vehicle investments in its next-generation battery-electric architectures,” the statement said. EVs are a lot simpler to build, given the simplicity of their power trains, the absence of emission control systems, and the like. The hard part is the battery, and automakers don’t own the battery-cell technology. This shift to EVs explains part of the “unallocated” plants. GM “will double” resources allocated to its electric and autonomous vehicle programs over the next two years, it said. This is a massive shift that other automakers are also undertaking, and plowing enormous resources into. EVs are happening on a commercial basis. 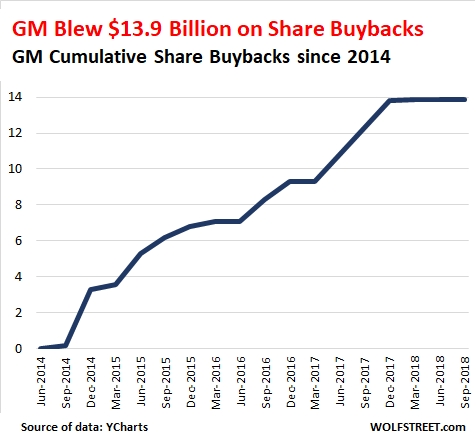 This money has to be borrowed, obviously: It “expects to fund the restructuring costs through a new credit facility,” GM said. But don’t worry. All those expenses incurred during this restructuring will be “adjusted” out of the non-GAAP metrics that Wall Street touts. GM reassured us in the statement that these costs will be adjusted out of EBIT (earnings before interest and taxes), adjusted EPS (earnings per share), and its “automotive free cash flow.” But the cost savings from reduced salary expenses, etc. will be fully represented in all metrics in all their glory. Wall Street’s accounting magic wins again.